I’m not ashamed to admit I love ramen. I adore the soupy comfort that can be found in a bowl of steamy broth and noodles cooked to perfection. There’s nothing quite like a hot bowl of ramen to warm you during the winter months. My fascination with ramen first began when I watched a ramen eating challenge. The petite Japanese woman sat at her table with excited anticipation as a steaming mountain of noodles surrounded by a rich hot broth was carried to her from the kitchen. I watched in awe as she methodically began to devour the monstrous 5kg bowl of noodles, beansprouts and sliced chashu. Admittedly it was excessive, but it was intriguing to see someone eat so much in one meal. “How is this possible?”, I asked myself, unable to look away. Perhaps if the noodles were really delicious. Those noodles did look pretty good. And so began my quest to find The Perfect Ramen. To be honest, it has probably been more of a ramen journey than a quest, because I don’t think there will ever be an end. I recall waiting in queue for almost two hours to get a table at a newly opened ramen restaurant. I have memories of arriving at a noodle shop in the morning so I wouldn’t miss out on their limited bowls of rich tonkotsu ramen. At times, my enthusiasm for good ramen has been mistaken by some as obsession. When I don’t have the time to go out for ramen, I make some at home. 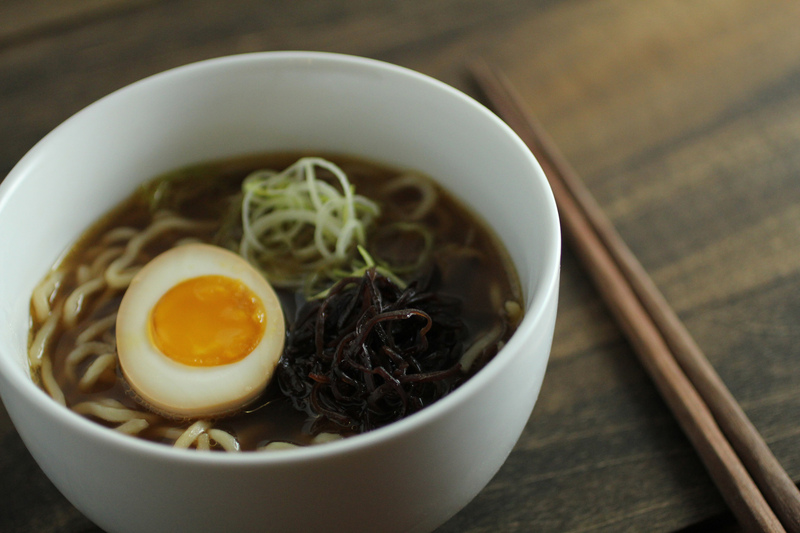 If you’re like me and sometimes need a quick ramen fix, you might like this simple shoyu ramen recipe. 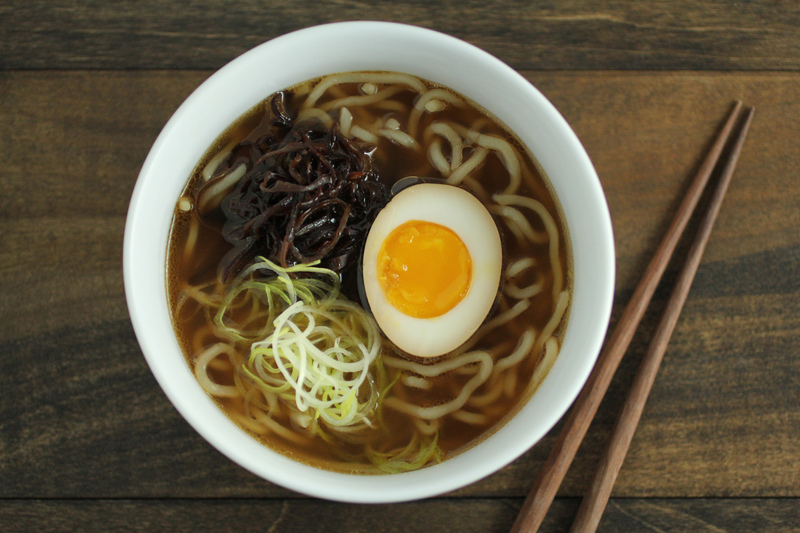 It’s simple, vegetarian and topped with an irresistible soft-yolk ramen egg. Soak the wood ear mushrooms in boiling water for 10 minutes or until soft. While soaking, finely shred the leek with a sharp knife or mandolin and set aside. Drain off the hot water carefully from the mushrooms and to cool. With a sharp knife, finely shred the mushrooms. Heat a small pan on medium heat and brush lightly with oil. Add the shredded wood ear mushrooms and sautee until tender. Season with a dash of soy sauce. In a large pot, combine the vegetable stock and sliced onion. Bring the stock to a boil over medium heat. Add 3 tbsp soy sauce and boil for 10 minutes. Add the ramen and cook for 4 minutes or until soft. Divide the ramen into bowls and pour broth over the top. Garnish the noodle soup with half a ramen egg, shredded mushrooms and leeks and a few drops of sesame oil if desired. Serve immediately. If you prefer a more delicate flavour than the leeks, you might like to use finely shredded cabbage or carrots instead.